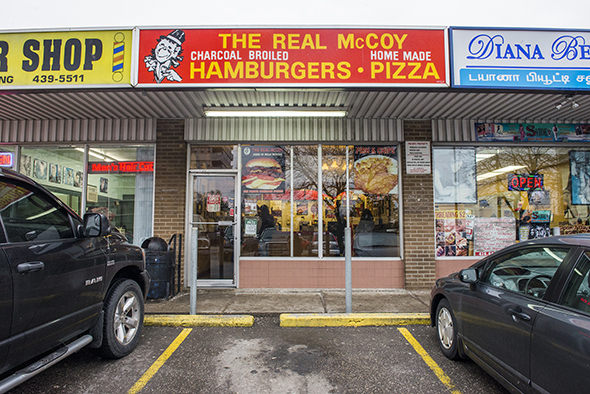 The Real McCoy is a Scarborough institution that's been cranking out burgers, fries and pizza for the past 48 years. The tiny space looks like a time capsule with team photos from The Real McCoy-sponsored baseball teams and hockey paraphernalia lining the walls. 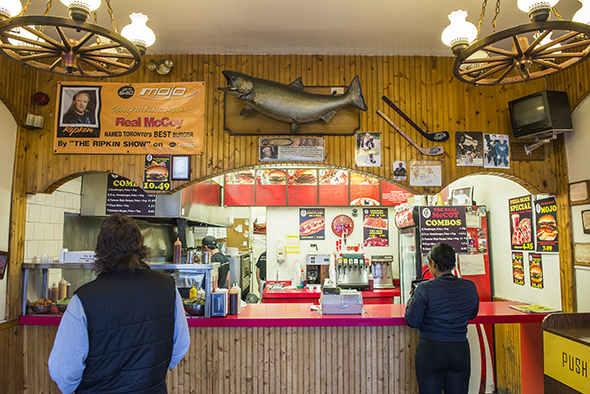 There's nowhere to sit down, but that's okay because most customers seem intent on doing take out. Owner George Mihail tells me his late father Elias, a beloved neighbourhood figure, started The Real McCoy in 1969. It's been in the family - and in the same spot - ever since. Over the years, the restaurant's received numerous accolades, including best burger in Toronto from the now-defunct MOJO Radio (AM 640). Mihail won with his banquet burger - he's since renamed it The MOJO Burger, a title he actually trademarked. The 8-ounce MOJO ($7.99) comes piled with American cheese and bacon. I ask Mihail to top mine with ketchup, mustard, mayo, lettuce, tomatoes and lots of pickles. When I try to order a Diet Coke with it, Mihail laughs until I request a root beer instead. That neighbourly service greets each customer who walks through the door. And Mihail and his team seem to know everyone. A group of construction workers come in for burgers and a pair on a daddy-daughter date stop by for poutine and pizza. 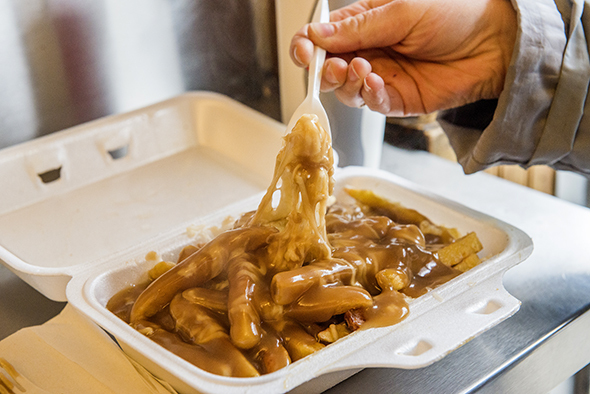 While the poutine's ($4.95/$5.95) not traditional (it has shredded cheese), the mass amount of gravy more than makes up for lack of cheese curds. And don't expect an authentic thin-crust Neapolitan pie here, either. 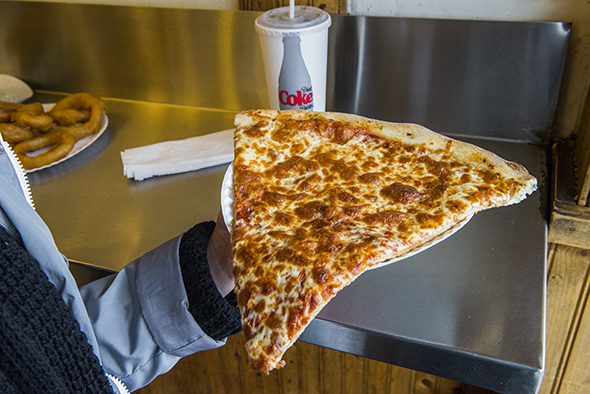 The Real McCoy serves up enormous slices ($3.49 each) - they're the satisfyingly greasy type, which are now rather hard to find in the city. 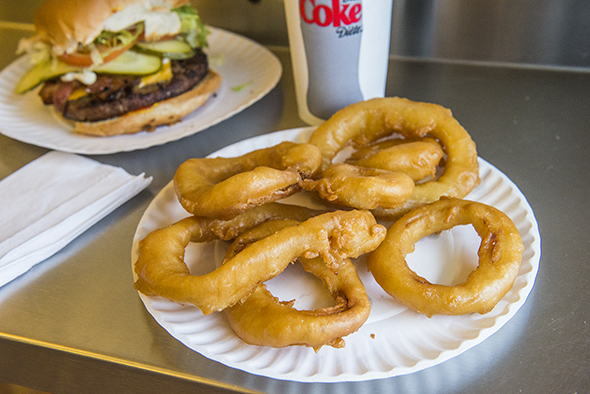 Onion rings ($3.59/$4.75) are also jumbo-sized. They come out on a paper plate, piping hot and golden brown after a dip in the deep fryer. 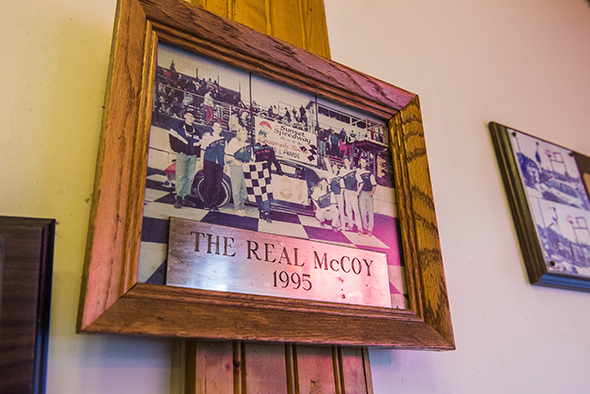 It's easy to see why The Real McCoy has a dedicated following, even from people who've since left the neighbourhood. 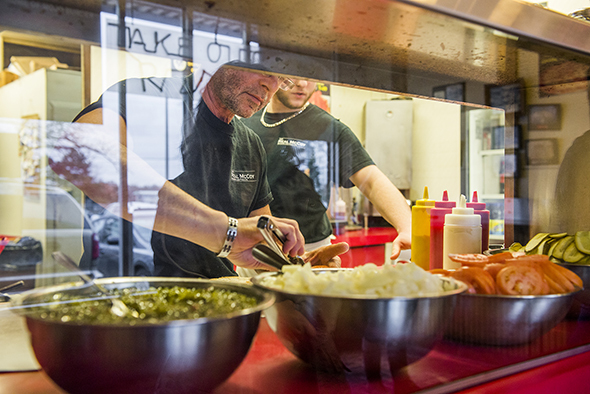 "They always come back," says Mihail, "and they always call it their comfort food."